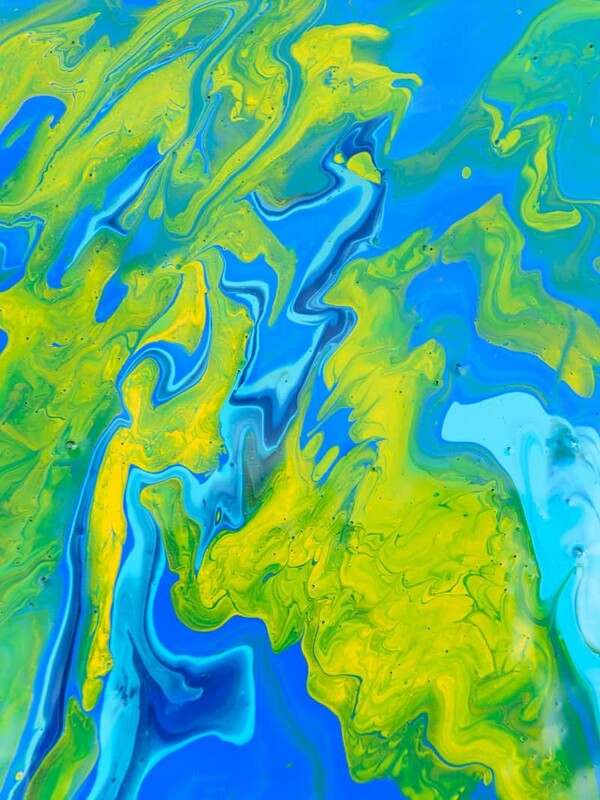 Ever wondered how to make an Acrylic Pour Canvas? It’s so easy! Messy, but super easy and fun. I really wasn’t sure how this was going to turn out. It could’ve gone one of two ways: it would look awesome or it would look like a legit hot mess. I mean, I mess up about 90% of my projects the first time around so when something comes out right the first time I freak out because I feel like a crafty goddess. And right now I’m feeling like a crafty goddess/unicorn because this acrylic pour canvas is seriously the coolest thing I’ve made for my office to date. Now, I’m not going to lie to you. This craft is super messy. If you’re super OCD and hate mess you may want to skip this one. BUT! If mess doesn’t scare you then you need to go get the supplies to make this craft asap! It’s really fun and looks so cool once it’s dry. 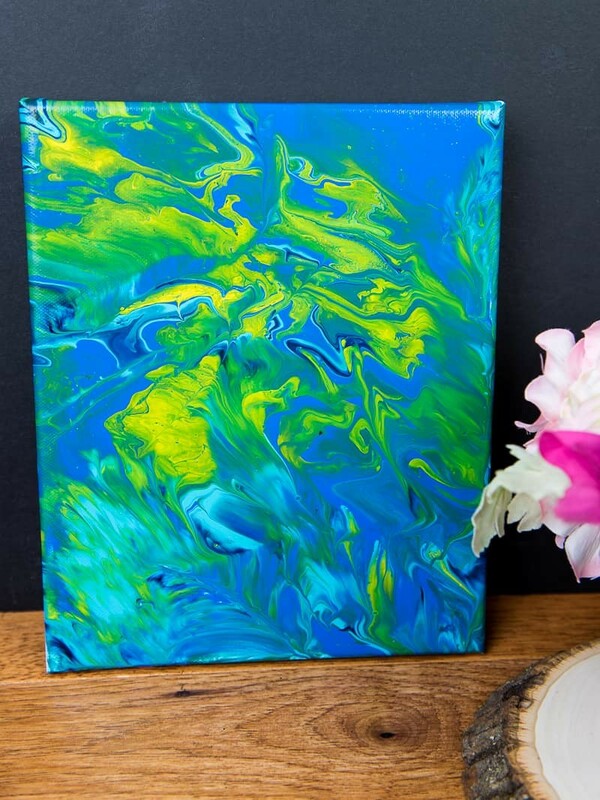 Make your own acrylic pour canvas! + Take 4 push pins and put them on the back of your canvas. One in each corner. This helps keep the canvas off the floor so the paint doesn’t pool underneath. + Pour each color paint into their own plastic cups. Just don’t use as much white as I did….Maybe cut the white in half. + Mix in a small amount of the pouring medium (or water if you don’t have the pouring medium) in with your paint until it is thinned out to a pouring consistency. Make sure you have no bubbles in your paint before you go to the next step! + Take the cup with the Titanium White paint and slowly start layering your other colors on top of it. Once they’re all in take one of your craft sticks and put it in your cup. Move it in a zig zag motion to “mix” the colors a bit before pulling it out. Remember, less is more so don’t zig or zag too many times! Also, look at that bubbles on the yellow paint. Ughhhh NOOOOOOO. You guys….get those bubbles out! Lesson learned for me. + Prime your canvas with the Extender Medium. DO NOT LET IT DRY! 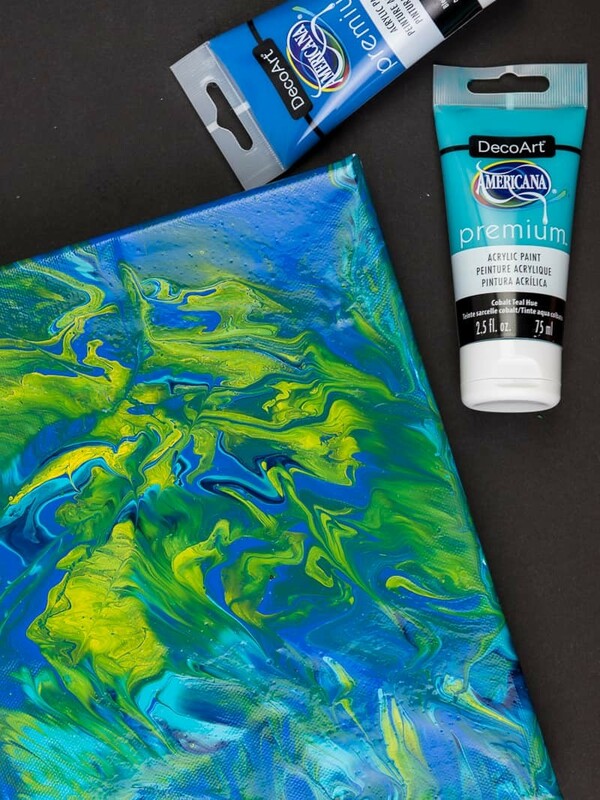 + Pour your paint onto your canvas while the extender medium is still wet. This will help you manipulate the paint and it’ll spread easier on the canvas. + If you have lots of leftover paint (like me!) pull out another canvas and POUR BABY, POUR! And then you let it dry. For forever. Okay, maybe not that long but at least do it for 36 hours. If you’re going to put vinyl on it…I’d wait another day or so (check back Wednesday for that tutorial!). You just don’t want that carrier sheet for your vinyl to pull up that pretty design you just poured. It’s better to be extra cautious than not cautious enough. You can’t overstir. SERIOUSLY. You cannot overstir. Stir baby, stir until all those bubbles are gone! Do not do this outside. Unless you like the look of dead bugs hanging out in wet paint. Picking them out isn’t fun AND it can mess up spots on your canvas. NOPE. Next time I’ll do it inside. Do not pick up these canvases while they’re still wet. (this is another reason to do them inside) I picked up the all blue one and completely wiped the paint off the sides of the canvas. Bummed can’t even begin to cover how I felt. I fixed it…but if you can leave the canvas in one place until it’s dry you won’t have to worry about this. Don’t be like me. Work smarter, not harder. And that’s it! You’re done! Hoenstly, the longest part about this acrylic pour canvas is setting everything up and letting it dry. I might’ve not thinned my paint out enough which is why it took so long to dry. I don’t know, I’ll have to try it again with thinner paint and see. But the best part is that you can pretty much use any color you want and create a really cool custom piece for your house. I’m already dreaming of one for our dinning room, though that one will have to be huge and I don’t know how I’ll pour it inside! Check out more of my quick and easy paint projects! A quick thing about me: I ♡ MY SILHOUETTE MACHINE. I also have a sweet passion for photography, pretty much any kind. I'm a little obsessed with Disney + Harry Potter and love to make nerdy things for our home and our son. Did you make one of our projects? Tag @simplymadefun on Instagram so I can CHECK IT OUT! Simply Made Fun is a participant in the Amazon Services LLC Associates Program, an affiliate advertising program designed to provide a means for sites to earn advertising fees by advertising and linking to Amazon.com. Disclaimer: Simply Made Fun is a for-profit blog. All companies and organizations that I work with are chosen by me. I will never post anything that is not an honest opinion of mine, regardless of compensation. There may be affiliate links present within posts that offer a compensation to me upon purchase. These will always be disclosed. Copyright: All images and content are copyrighted by Teresa Cox and Simply Made Fun, unless otherwise stated. Images may not be cropped or altered under any circumstances without written consent. If you quote any content from this blog, please be sure to link back and give proper credit. Thank you!